First let's recap how we found the Sigma Cauldron and the way through to the BOSS room at the end. The Sigma dungeon lies about 10-15 mins north of the Proving quest and you will no doubt Override a Tallneck on your way to this part of the map. This Tallneck is one of many but will happily reveal the eastern side of the map for you, including several important map markers. All of the Cauldrons in Horizon Zero Dawn are marked on the world map with a triangular blue icon. The design differs slightly between each Cauldron but the overall theme is still a blue triangle. The entrance to the Sigma Cauldron is fairly easy to find, on the side of a small mountain and guarded by a number of Watchers and Shredder machines. Upon finding the Cauldron, the familiar Override symbol is plain to see on the metal door. Simply walk up and hold Triangle on the controller to override the door lock and open the entrance to the dungeon below. The dungeon is a beautifully designed underground area with machines creating machines, much like a Matrix movie scene.. Your first dungeon is a great experience in HZD so enjoy the moment. For this particular Cauldron the route is fairly simple. Guide Aloy through the early tunnels and work your way to a small outside area and round to the left. Climb up the small cliffside and into another tunnel entrance and on to a larger area with conveyor belt machines carrying materials. Take note of the yellow climbable points as you progress the dungeon, using these to hang onto the conveying and ride across gaps. After enough riding and climbing you will eventually reach a larger area known as the Core. This is the final BOSS fight room and successfully defeating this BOSS will reward you with new overrides that you can use to pacify new machines in the wild. Also take note of the purple treasure box in this BOSS room for a FREE very rare modification. 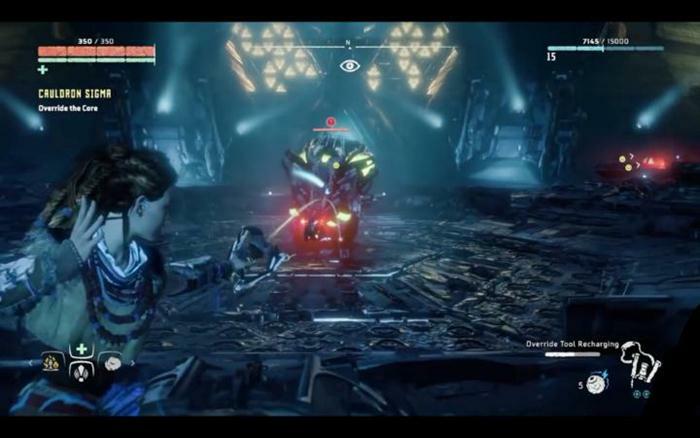 Aloy enters the BOSS room from above giving you the chance to scout the overall layout and understand the mechanics of this little puzzle. The real key to starting the BOSS fight is to climb up the tower to the left of the electrified bubble in the middle of the room. Climb to the top and use the override tool to disable the electric shield and release the Fire Bellowback. Now the real fund begins!! 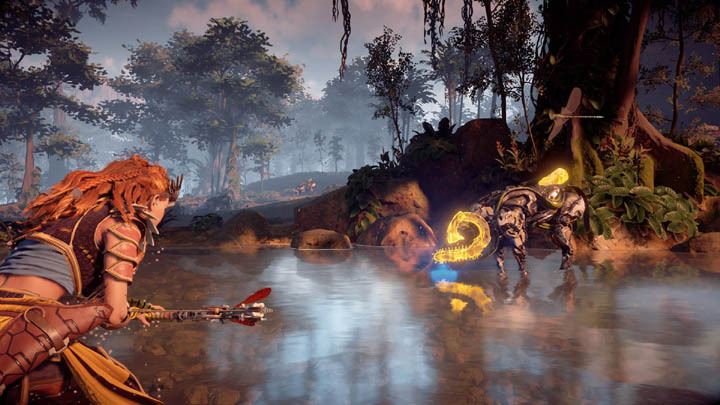 The Fire Bellowback is a rather tough opponent in Horizon Zero Dawn, certainly tougher than the Sawtooth BOSS that you defeated previously The main reason for this imbalance is the Bellowbacks fire spray which he can use to light small pockets of the BOSS room on fire. 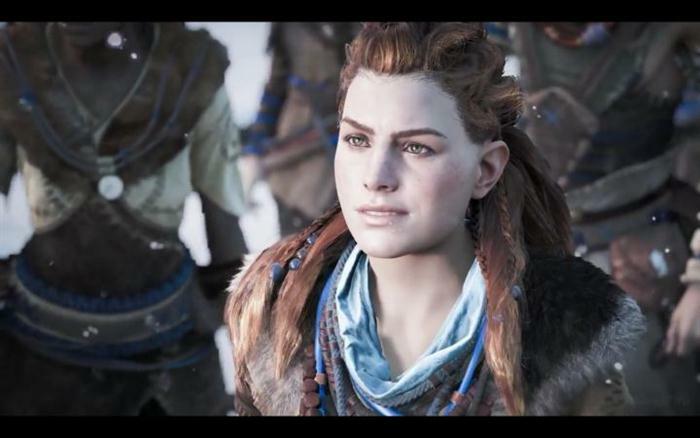 A direct hit with sverely punish Aloy's health and accidently stepping on the burning floor will have the same detrimental effect. Before the start of the fight, make sure you craft enough arrows and Tripcaster traps to see you through. Avoid having to craft anything during the fight unless forced to. Take the opportunity to further your skill tree before the fight. My preference was to increase the number of arrows that can be fired simultaneously from a single shot to double or even treble if you can spare the skill points. Critical hits are good and increasing the melee attack damage is also a worthwhile investment. Wait for the electric bubble shield to drop and immediately lay two tripwire traps. It's up to you where you place these but I found that it's best to incapacitate the beast asap so lay the wires close to his original position. Alternatively you could lay them in a spider web formation to aid your circular movements later. It's not too important so long as they're going to snare either the Bellow or the smaller machines in the room. Aloy's roll move is an essential part of any fight in HZD and certainly for this one. I found that rather than rolling in the direction of the camera, face the Bellowback and roll sideways so you can continuously fire arrows and still roll without losing sight of the creature. Wait for the incoming bombardment, roll, roll again and take aim. Repeat. Work your way around the room in a circular direction, with the Bellowback in the middle. The Bellowback is well protected from the front thanks to those massive plates but from the side and back he is vulnerable. Of huge importance is the giant storage container on his back which contains the means to shoot fire - you must absolutely disable this as soon as possible. As you roll around the circular room avoiding the fire, wait for the opportune moment when the beast isn't firing to aim carefully for his back and unleash as many arrows as you can during this window of opportunity. After enough arrows have hit the weak spot the Bellowback will explode in a shower of fire, seriously damaging his health and offensive capabilities. I found that the first 2-3 mins of the fight are certainly the hardest, until you have destroyed that tank on his back. At this point in the fight you now have the upper hand with only two things to worry about - the smaller Watchers in the room and the charge attack from the Bellowback. Taking the Watchers out shouldn't be too hard but the Bellow still has a deadly charge attack. Continue the rolling strategy and dodge out of the way of the charged attacks - then counter the Bellowbacks other weak spots: canisters and head, to take him down. Successfully killing the Fire Bellowback will reward you with a Very Rare Modification with a 39% corruption rating. Freeze bombs are highly effective against the Fire Bellowback - buying you a lot of time to strike unopposed. You'll need to buy the sling weapon first and then craft freeze bombs, but this is well worth the effort. Don't venture into the fight unprepared - you'll need resources to craft additional arrows and plenty of medicinal plants or health potions to restore lost health. If you are unprepared ,consider restarting from a previous save point and stocking up first.